The importance and relevance of the greatest rivalry outside of the international arena needs little introduction. As is becoming the norm, Leinster and Munster come into the real start of the rugby season in a state of hope as much as preparedness. Leo Cullen and Rassie Erasmus are hoping they are on the right track given that the meat of the season is now upon us. One statistic worth noting is that both run on for this massive encounter with almost identical playing records to date (four wins, one loss, 19 points) with Munster shading the points-scored differential by four (65 to 61). In terms of continuity Erasmus could have, if he had wanted to do so, field (with the exception of Donnacha Ryan) virtually the same team which lost to Leinster (25-14) in the corresponding game a year ago. Cullen, by contrast, has been denied the services through injury of a significant quartet in Rob Kearney, Garry Ringrose, Isa Nacewa and Jamie Heaslip. The Munster front-row is becoming a formidable scrummaging unit with Dave Kilcoyne, Niall Scannell and John Ryan closing the power gap on their Leinster counterparts. James Cronin will be missed but Stephen Archer offers impact with Liam O'Connor developing. The back-row, along with Jack O'Donoghue in reserve, and Conor Murray as an extra guard, represent the core of this Munster side. Given any sort of platform up front or go-forward ball behind, in Peter O'Mahony, Tommy O'Donnell and CJ Stander, they possess the wherewithal to wreak havoc at the breakdown. Cullen's back-row trio are no shrinking violets but if Munster are to reverse last year's defeat then the strongest unit in the team has to deliver. On the assumption the scrum holds its own, it should be the line-out where Munster look for an advantage. Even allowing for the significant presence and form of Devin Toner, the Leinster set-piece has not been firing. That said, unless Peter O'Mahony can exert his athleticism, the battle for primary possession could be of the 'throw and hope' variety. Billy Holland is a key cog in so many ways but as of now, for various reasons, Munster are struggling to replace Ryan in the nitty-gritty. I worry too in midfield. With Jaco Taute ruled out for effectively the season the task in striking a balance with the centre combination will not be easy. 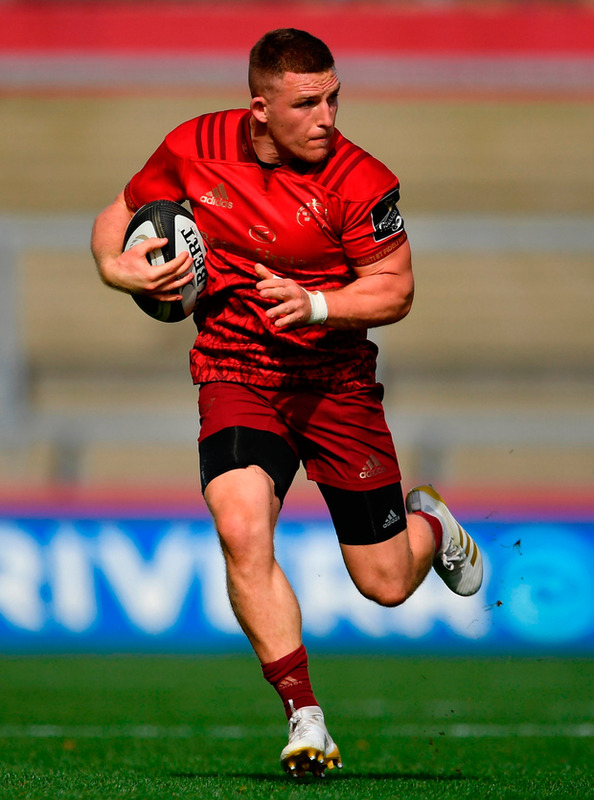 Leinster are also short on options in the same sector but given that Taute, Munster's key player defensively, has been removed from the equation the heat is on in the search for balance. Opportunity knocks for JJ Hanrahan and Chris Farrell in the coming weeks as Rory Scannell impressed against Cardiff despite shooting up too quickly at times. Given the absence of the international elite, new blood has been tested by both management teams. And aside from that Leinster blip in Bloemfontein where they were well beaten, and Munster likewise in Glasgow where they came a poor second, Cullen and Erasmus would have been relatively pleased. The posturing is over and with hand on heart I don't know which province is better placed ahead of today's kick-off. Taute's loss for Munster is significant but I would argue that the absence of Nacewa is even greater for Leinster. O'Mahony is back and you cannot put a value on his presence. Having him in the dressing-room is worth its weight in gold. He is this team's Paul O'Connell and Anthony Foley before that. Holland is also a selfless leader while the influence and big-match temperament of Stander and Murray speaks for itself. Keith Earls is coming of age in that regard but the O'Mahony/ Stander/Murray axis is the key. The biggest psychological obstacle is in the red corner and it is the venue, given that Leinster have taken seven of the last eight meetings between the sides at the Aviva. The Munster head coach went on record after the defeat in Scotstoun a fortnight ago describing it as the worst Munster performance on his watch. It was poor but equally bad, if not worse, given the proximity of the matches and performances to each other, were the two at the same venue against Saracens in the Champions Cup semi-final followed by the collapse against Scarlets in the PRO12 final in May. In both massive games Munster all but froze, at least that's how it appeared given the lack of any discernible tactical strategy beyond repetitive and more often than not aimless use of the boot. Whether there was a significance in Murray scarcely putting boot to ball in last Saturday's win over Cardiff we will know a little later. Munster will not want for support but it's time for the players to deliver an Aviva performance befitting the occasion, not to mention the loyalty of their fans. This Munster group have as many options in the wider channels as I can recall. Take any three from Andrew Conway, Darren Sweetnam, Earls, Alex Wootton, Ronan O'Mahony and Simon Zebo, and now with Hanrahan in the mix too, and the back-three larder is well stocked. While picked on the wing for today, I would like to see Conway (below) consistently playing at full-back. He is not on All Black Damian McKenzie's level but is very much a quality player of that ilk. Of course, six into three won't go but a combination of Hanrahan, Conway and Earls mixes pace and finishing with real creative potential. It puts Munster in a strong position down the outside flanks. Earls has that creative spark, that attacking ingredient, call it X-factor, in abundance. That said, press me to name one Munster player to turn today's game, and Conway is the man.